On March 19th 2015, Farkhunda, a 27-year old woman completing her studies, was lynched by a mob in a Kabul street for being suspected of setting alight a copy of the Q’uran or a Tawiz (an amulet, it’s not clear). The family ‘s first reaction (that is to say, before demanding justice), seems to have been explanatory, nearly apologetic, claiming she was suffering severe mental problems and depression—a condition which according to research affects a significant proportion of the female population in Afghanistan. One hardly needs to wonder why. Farkhunda’s fate reminds me of the execution of Zarmina in a public stadium in Kabul by the Taliban, in the closing years of the XXth century. This was the time that I came into contact with a then very active, but still unknown, militant group in Afghanistan, RAWA, the Revolutionary Association of the Women of Afghanistan. This secular, egalitarian group was the only one fighting the Soviet intervention not from a religious point of view but from a socialist alternative standpoint. Documenting Taliban abuses was one of its aims. Thus, one brave woman smuggled in a camera to the stadium and hid it in the folds of her blue burqa to film Zarmina’s execution. Had she been spotted, she would have been killed along with her comrades. I was sent this film in Paris with the hope of showing it on TV. This being pre-9/11, it did not interest anyone at the time, one company telling me that the quality was too poor to be aired on public media! Naturally when Afghanistan became the flavour of the new millennium, these images were immediately appropriated by prominent spokespeople in the name of self-righteous, if tardy, indignation. It took me several years to get the real hero over to Paris to tell her tale on TV. Just to remind you: the images show a female figure in a burqa being dragged to the centre of the stadium by other similarly clad women (presumably policewomen) , made to sit and then shot by an executioner in a turban behind her, firing with a Kalashnikov. Apparently thousands were forced to look on, including the hapless victim’s seven children. Zarmina’s fate became a cause célèbre after 9/11, it was shown as a true example of Taliban evil, complete with sinister beards and head-dresses. The film went global and served to legitimate the US and Allied intervention on the promise, as G.W. Bush repeatedly mouthed, of liberating Afghan women from such outrages and bringing them Western-style democracy and human rights, etc. Fast forward to now, Now Ruz 2015. Zarmina’s twins (whom she was allowed to wean before being executed) are now adults. The US intervention has come and practically gone, purportedly having created the basis for democracy. Admittedly schools, hospitals have been built, a class of urbanized educated women has been somewhat empowered, the foundations for a possible state have been laid—at least on paper. The only overriding achievement is that henceforth Afghanistan is the world capital for the cultivation of the opium poppy and cannabis and provides over 75% of the planet’s consumption of these drugs, despite the billions spent in attempted eradication. Compared to the modest statistics in Taliban times, this, in terms of cynical numbers, is the single greatest Afghan success story of recent times, far more considerable than the reduction of maternal and child mortality which continue to be catastrophic. Look (if you can stomach it) at the horrific images of Zarkhunda’s lynching. Again a totally veiled woman, no face showing, like Zarmina, savagely beaten with sticks, and stoned until she is but a bleeding rag-doll. But scrutinise the henchmen shouting Allah-u-Akhbar. No bearded Taliban here or shalwar-kamiz, but young men, some teenagers, slick short hair, leather jackets, jeans, wielding sticks and cell phones to film the scene. One executioner proudly posted the scene on his Facebook page. Looking just like their contemporaries anywhere on the planet, these kids do not appear to be older than 25, which means that they all benefited, however diminutively, from the possibilities afforded to them by the nascent institutions of Post-Taliban Afghanistan. Something comparable could be said for all the thousands leaving Europe and parts of North Africa (especially Tunisia) to join the ranks of ISIS. They are not all illiterate and starving, nor victims of some imperialist plot. Nor were the uniformed and armed Kabuli policemen, however poorly paid, who were calmly watching the lynching. Are we asking the right questions? For a start, there is no real ‘Before’ and ‘After’ Taliban but a continuum of abuse against human rights in Afghanistan, which started to escalate more dramatically as from the Civil War, (after the collapse of the pro-Communist regime) between warlords, some of whom are still in power. Should one be surprised that officials in the government and clerics came out in support for the lynching? As far as I am aware, the public murder did not make the immediate headlines in Afghanistan or Pakistan. From Thursday when it happened until Saturday evening, I hardly saw it posted on any Afghan Facebook pages that I subscribe to either, except from a couple of outraged individuals not representing anyone. I am willing to be proven wrong. There were more details to be had from the Western press, suitably and predictably horrified..
My permanently angry friend FS suggested that one should think the situation out in the light of the Charlie Hebdo issue. Hapless Farkhunda, it seems, was not burning anything at all but the suspicion of sacrilege seems to have been enough to warrant and justify her public lynching with the tacit blessing of the authorities. Three interlocked features have been normalized here: first the undefined notion of blasphemy overriding constitutional law which in turn removes citizenship and human dignity from anyone suspected of committing what any other (male) individual may consider a felony. This in turn allows any (male) person the right to represent divine justice and turn himself into an executioner. For what it was worth, Zarmina went through some semblance of a Taliban-style trial but Farkhunda was murdered point-blank in broad daylight, in a crowded neighbourhood. The notion of state, already moribund with Karzai, seems to have entirely disappeared in Ashraf Ghani’s Afghanistan. Like everywhere else, the condition of women’s rights constitutes the only valid indicator for the maintenance or absence of true democracy and human rights. In Afghanistan once again, this tragedy with a woman’s death at its epicentre is a symptom of the potential collapse of the state if real justice is not carried out and human rights not enforced by law. 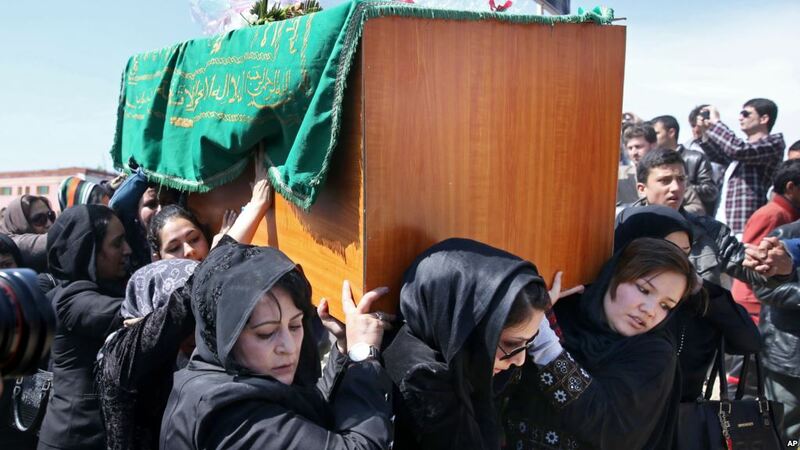 The women clad in black carrying Farkhunda’s coffin today may well be burying their hopes and futures for a better world.